What would Peter do to celebrate the 60th Anniversary release of Peter Pan on Blu-ray Combo pack? Treat the Lost Boys and the rest of his carefree crew to a party, of course! 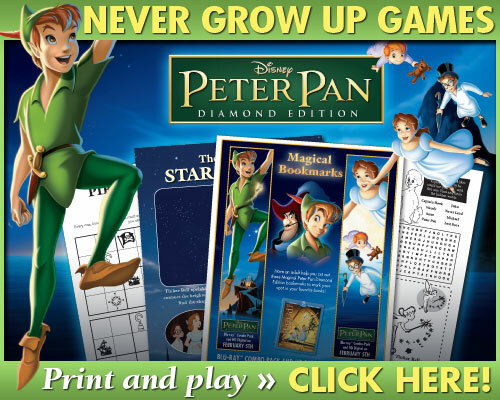 Peter Pan’s Never Grown Up Games include Printable Pirate Puzzles, Connect the Dots Darling Star Gazer and Never Land Fun & Games complement Magical Bookmarks featuring your favorite characters! Set sail for an afternoon of adventure with Pirate Ship Pizza, treat everyone to part of the loot with Peter Pan Grab Bags and keep the fun going with Character Coloring Pages! 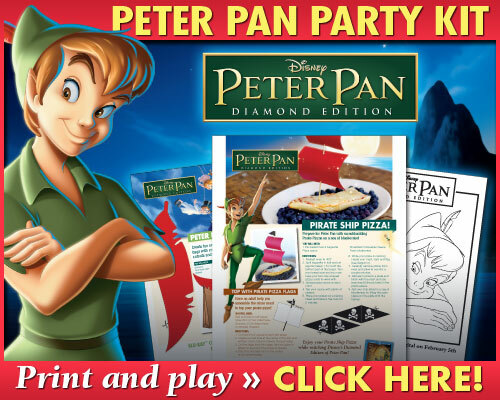 These Peter Pan Party Kit activities are sure to have everyone feeling like part of Peter’s inner circle! Does your family believe in magic, fairies, Never Land? The feature below takes a look at whether there might be a real Never Land out there! 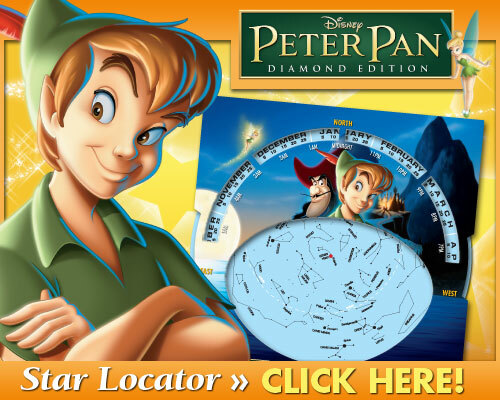 In celebration of today’s 60th Anniversary release of Peter Pan we’re providing printable Star Gazing Locator Tools to help your family look at the constellations in the night sky to figure out where you think Never Land might exist! 1 Winner will receive a Peter Pan Prize Pack! The Prize Pack Includes: 1 top hat, 1 pair of glasses, 1 nightshirt and 1 umbrella. Disclaimer: An email address is required to enter. The winner will be chosen randomly through Giveaway Tools and contacted via email. A reply to the winning email is required within 24 hours before a new winner is chosen. One person entering per household please. U.S. only. This giveaway ends at 11:59 PM EST on March 6, 2013. I was provided with product for this review. All views and opinions with regard to Peter Pan Giveaway, Peter Pan Printables or the company are my own and were not influenced by the company. Peter is my favorite character. Tinker Bell is my favorite! I like the dog, but I don’t remember his name! Tinkerbell. She is my favorite character. I always wanted to be Tinkerbell when I was little. Smee! Not so much the character, I just like saying Smee! Wendy is my favorite as she is quite the little mother. I love both Peter & Wendy. Tinkerbell is my favorite peter pan character. She is spunky with an attitude. Wendy is my favorite character. I love Tinkerbell, she is funny. My daughter loves Tinkerbell! She’s her favorite as she says! Tinkerbell is my favorite. Thanks for the giveaway. Tinkerbell is a celebrity in our house. I like Tinkerbell and Nana. My fave is Tinker Bell! As a kid, I liked Wendy. But now, my favorite is Tinkerbell. I’d have to say Wendy! Tinkerbell is my favorite character. Nanna the dog really speaks to me. She rocks! I love Wendy the most. Who is your favorite character from Peter Pan? Tinker Bell is my favorite. Thanks for the contest. My favorite is Peter Pan. Nana is cute, tho plays a tiny part. I wanted to say something different.